Pullorum disease, caused by Salmonella enterica serovar Pullorum (S. Pullorum), is one of the most important bacterial infections in the poultry industry in developing countries, including China. To examine the prevalence and characteristics of S. Pullorum, the Multilocus Sequence Typing (MLST) genotypes, fluoroquinolones resistance, and biofilm-forming abilities of S. Pullorum isolates were investigated, collected from 2011 to 2016 in China. Thirty S. Pullorum isolates collected from 2011 to 2016 were analyzed. Quinolones susceptibility testing showed that 90% of the isolates were resistant to the first generation of quinolines nalidixic acid, but the resistance rates to different fluoroquinolones agents were lower than 13.3%; for some there was even no resistance. Multilocus sequence typing (MLST) showed that ST-92 was the dominating genotype, accounting for 90.0% of all S. pullorum strains. The remaining three isolates were of the new reported sequence type ST-2151. Interestingly, the Asp87Gly substitution in quinolone resistance-determining regions (QRDR) of GyrA was only observed in the three strains of ST-2151, suggesting a potential correlation between Asp87Gly substitution and sequence type (p < 0.05). However, Asp87Gly substitution could not confer the resistant to ofloxacin and ciprofloxacin of these isolates. The plasmid-mediated quinolone resistance (PMQR) gene was not found in any of the tested isolates. Furthermore, an assay measuring biofilm-forming abilities showed that 46.7% of the isolates were non-biofilm producers, while 53.3% could form very weak biofilms, which might explain the relatively lower resistance to fluoroquinolones. We reported a high resistance rate to the first generation of quinolines nalidixic acid and relatively low resistance rates to fluoroquinolones in S. Pullorum isolates. In addition, weak biofilm-forming abilities were found, which might be an important reason of the low fluoroquinolones resistance rates of S. Pullorum isolates. ST-92 was the dominating genotype demonstrated by MLST, and the new sequence type ST-2151 showed a potential correlation with Asp87Gly substitution in QRDR of GyrA. We believe the characterization of these S. Pullorum isolates will be helpful to develop prevention and control strategies. Salmonella enterica serovar Pullorum (S. Pullorum) can cause severe infectious pullorum disease (PD) in chicken and some other domestic birds, leading to a serious threat to the poultry industry . Because the transmission of S. Pullorum occurs both horizontally and vertically , eradication programs, especially for breeding birds, are carried out in many countries. However, due to extensive testing and eradication costs, in addition to the genetic diversity of S. Pullorum, S. Pullorum is still very common in the poultry industry in Africa and Asia, including China [3, 4]. In most of the developed countries, strict eradication programs have eliminated S. Pullorum from the commercial poultry flocks , but in noncommercial poultry flocks, outbreaks of PD occur constantly . In China, S. Pullorum is still a widespread pathogen in the poultry industry. Gong et al. found that, from 2006 to 2012, S. Pullorum was the most frequent serovar of S. enterica, accounting for 17.0% . Liu et al. reported that 17 out of 121 Salmonella strains obtained from food, fodder and live chickens were S. Pullorum . Investigating the genetic characterization of epidemic strains will help us to better understand the epidemiology. Multilocus sequence typing (MLST) has been used to study the evolution and epidemiology of a number of bacterial pathogens, with the advantage of comparing the results across various laboratories using the same analysis . In addition to eradication, use of antimicrobial drugs is still one of the main measures to control S. Pullorum infection. However, the use of antimicrobial agents contributes to the dissemination of antimicrobial resistance, and results in an increase of multiple drug-resistant bacteria . Therefore, use of chloramphenicol, tetracycline and some other older antimicrobials is now limited in animal feeding, and fluoroquinolones are one of the most commonly used antimicrobial agents in poultry farming. Unfortunately, with the use of fluoroquinolones, resistant Salmonella strains are increasing worldwide [11–13]. The main resistance mechanisms include mutations in quinolone resistance-determining regions (QRDR) of DNA gyrase and topoisomerase , and presence of a series of plasmid-mediated quinolone resistance (PMQR) genes . Mutations in QRDRs and presence of PMQR have been frequently reported in foodborne Salmonella infections in China and other countries [16, 17]. To examine the prevalence and characteristics of S. Pullorum, the MLST genotypes, fluoroquinolones resistance, and biofilm-forming abilities of S. Pullorum isolates were investigated, collected from 2011 to 2016 in China. From 2011 to 2016, 692 swab samples were collected from chickens with PD and healthy-looking chickens in five provinces of China. Chickens with PD showed typical symptoms, such as white diarrhea, lethargy and so on, and some were dead. Healthy-looking chickens were chickens without obvious symptoms. Collected samples were directly placed into Cary-Blair modified transport media (AMRESCO, USA) and transported to the laboratory for Salmonella isolation. Swabs were cultured in 9 mL of Gram negative (GN) broth (Tianhe, China) at 37 °C for 24 h before aliquots of 100 mL of the broth were streaked onto Triple Sugar Iron agar (TSI, Oxoid, England). Typical Salmonella colonies were confirmed by PCR amplification of the hut gene, the primers were as followed, hut-F, 5’-ATGTTGTCCTGCCCCTGGTAAGAGA-3′, and hut-R, 5’-ACTGGCGTTATCCCTTTCTCTGCTG-3′ . S. Gallinarum biovar Pullorum was determined by a slide agglutination test with O-antigen antiserum and a tube agglutination test with H-antigen antiserum . The isolates were also identified using duplex PCR analysis, as described previously . MLST was carried out to determine the genetic diversity of the isolates, as previously described . Briefly, seven housekeeping genes (aroC, dnaN, hemD, hisD, purE, sucA, and thrA) in each tested isolate were amplified and sequenced. Sequences alignment were carried out using the Salmonella enterica MLST database (http://enterobase.warwick.ac.uk/species/senterica/allele_st_search), and allele numbers and sequence types (STs) were assigned. Biofilm formation abilities were assessed by crystal violet staining as previously described [22, 23]. Briefly, 100 μL of the cell culture (OD590nm = 0.1) was added to a 96-well polystyrene tissue culture plate (Corning, USA) and incubated at 37 °C for 48 h to form biofilms. To stain with crystal violet, cells were discarded, and each well was washed with water and dried. Then, 120 μL of 1% crystal violet solution was added and incubated without shaking for 30 min at room temperature. After washing off the unbound crystal viole, bound crystal violet was dissolved in 20% (v/v) acetone-containing ethanol and the OD630nm of the dissolved crystal violet solution was measured. All the tests were performed in triplicate. The Salmonella Enteritidis CVCC3375 strain was used as a positive control and three wells without inoculated bacteria were used as the negative control. Two times the negative control value was defined as the cutoff OD value (ODc) [24, 25]. According to the OD values, strains were classified into non-biofilm producer (OD ≤ ODc), weak biofilm producer (ODc < OD ≤ 2 × ODc) or strong biofilm producer (OD > 2 × ODc) [24, 25]. According to the Clinical and Laboratory Standards Institute Standards guidelines (CLSI) , (fluoro)quinolones susceptibility of the S. Pullorum isolates was determined by the disk diffusion method as previously described . 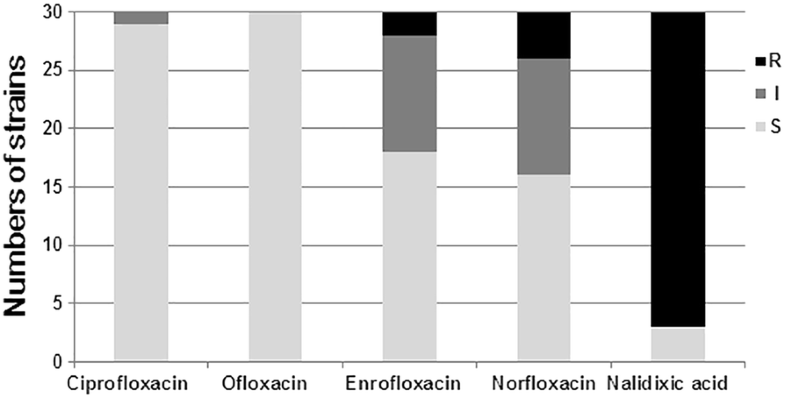 A total of five (fluoro)quinolones antibiotics, including ciprofloxacin, ofloxacin, enrofloxacin, norfloxacin, and nalidixic acid (Oxoid, England) were tested. E. coli strain ATCC 25922 was used as the quality control. To detect mutations in QRDRs of DNA gyrase and topoisomerase in the isolates, DNA was isolated and four genes of each strain, including gyrA, gyrB, parC, and parE, were amplified by PCR, as previously described . The products were sequenced and mutations in QRDRs were identified by sequence alignment. To detect mutation in the PMDR genes, AAC-Ib, qnrA, qnrB, qnrC, qnrD, qnrS, integrase, and intergron were amplified by PCR using the primers and amplification conditions as previously described . To test for the correlation in resistance rates and biofilm-forming abilities between different sources, and the correlation between point mutation and sequence type, the fisher test was performed with p < 0.05 considered statistically significant. The statistical analysis software was SPSS 19.0. A total of 30 Salmonella strains collected from 2011 to 2016 were identified as S. Pullorum. The isolates are listed in Table 1. Of these strains, 18 were isolated from chicken with PD, and 12 were isolated from chickens without obvious symptoms. MLST detected only two STs. Of these, 27 strains were ST-92, accounting for 90.0% of all S. Pullorum strains in this study (27/30), and the remaining three strains were ST-2151. Only one loci (hemD) was different between strains of ST-92 and ST-2151. G296C and A510G nucleotide substitutions were found in the hemD gene in strains of ST-2151 and this was not the case in strains of ST92. An additional file shows this in more detail (see Additional file 1). All the three strains of ST-2151 were isolated from chicken farms with serious outbreaks of PD. The ODc to define biofilm producer was OD630nm = 0.210. Based on the OD630nm, 30 S. Pullorum isolates were classified into two groups. Fourteen isolates (46.7%) were identified as non-biofilm producers (OD630 ≤ 0.210), while 16 isolates (53.3%) were weak biofilm producers with OD630nm ranging from 0.217–0.259, and there were no strong biofilm producers (OD630nm > 0.420). In contrast, the OD630nm of the S. Enteritidis reference strain was 0.441, classifying this as a strong biofilm producer. Among 18 isolates from chickens with from PD, eight were weak biofilm producers, and among 12 isolates from healthy-looking chickens, eight were weak biofilm producers. The fisher test showed that the positive biofilm rates between these two sources were not significant correlated (p > 0.05). As shown in Table 1 and Fig. 1, all of the S. pullorum isolates (100%) were susceptible to ofloxacin, and 29 strains (96.7%) were also susceptible to ciprofloxacin with the exception of one that was intermediate. Two strains (6.7%) were resistant to enrofloxacin, ten (33.3%) were intermediate, and 18 (60.0%) were susceptible for this antibiotic. Four strains (13.3%) were resistant to norfloxacin, 10 (33.3%) were intermediate, while 16 (53.3%) were susceptible. In contrast, 27 strains (90.0%) were resistant to nalidixic acid, which was a significantly higher resistance rate than resistance rates to fluoroquinolones (p < 0.05). Only three strains were susceptible to all of the tested (fluoro)quinolones. Three strains typed as ST-2151 were only susceptible to ofloxacin and ciprofloxacin. The correlation between biofilm-forming ability and quinolones susceptibility was further analyzed. Although the proportions of quinolones susceptible isolates of negative biofilm strains were higher than in weak biofilm strains, there was no significant correlation between biofilm and quinolones susceptibility in our study (Table 2). Asp87Gly substitution in GyrA was found in three strains (3/30, 10%), and one of these three strains, WX46, had a Leu451Ile substitution. An additional file shows this in more detail (see Additional file 2). These three strains were the only three strains of ST-2151 in our study. The correlation between sequence type and Asp87Gly substitution was calculated by fisher test, and showed p < 0.01. Amino acid substitutions in topoisomerase parC and parE were not found. In addition, none of the S. Pullorum isolates had the qnrA, qnrB, qnrC, qnrD, qnrS, and AAC-Ib genes, and integrase and intergron were also not found in these isolates. In recent years, S. Pullorum has been eradicated in the commercial poultry flocks in most of the developed countries. However, in some developing countries, including China, PD is still a serious problem in the poultry industry . Investigating the genetic characterization of S. Pullorum will help to better understand the prevalence of this poultry pathogen. Considering that MLST has the advantage to compare the results across various laboratories, MLST was used to analyze the genetic diversity of S. Pullorum in this study. Previous studies showed that STs strongly correlate with serovars [29, 30]. Our results found that 27 out of 30 S. Pullorum strains were ST-92, which was consistent with previous reports . This result suggested that ST-92 was the main genotype of S. Pullorum. In the study by Liu et al. of 17 tested S. Pullorum, other than strains of ST-92, one was ST-11, which was relatively similar to the sequence type of ST-92 . In our study, three strains of ST-2151 were found, with only two substitutions in the hemD gene, and therefore we infered that ST-2151 was derived from microevolution of ST-92. To the best of our knowledge, this is the first report on ST-2151. S. Pullorum strains are characterized by D serogroup and the same O-antigens. It was shown, however, that a few S. Pullorum strains are slightly variable in O-antigens, resulting in variants and an intermediate type . Whether there is a relationship between different STs and variation in antigens in S. Pullorum is unknown. Gong et al. found that the fluoroquinolone resistance rates of S. Pullorum in China have strongly increased in recent years . In this study, we tested the susceptibility of S. Pullorum isolates to five (fluoro)quinolones agents, including the first generation of quinolines, nalidixic acid, and four fluoroquinolones agents, which are currently widely used in the poultry industry. A high resistance rate to nalidixic acid was found, but the resistance rates to fluoroquinolones were relatively low, with no resistance to ciprofloxacin and ofloxacin in our test. Interestingly, the S. Pullorum isolates from one collection of samples showed different susceptibilities to tested (fluoro)quinolones agents. For example, strains GC81 and GC82 were susceptible to all of the tested agents, but strain GC80 was only susceptible to ofloxacin and norfloxacin. As previously reported, PMQR and amino acid substitutions in QRDR, which widely exist in resistant Salmonella, can result in different levels of resistance to fluoroquinolones . In some other pathogens, such as Campylobacter, substitutions in gyrA are very common, resulting in high resistance to fluoroquinolones . Compared to the presence in some other bacterial pathogens and other serovars of Salmonella, no PMQR and a lower amount of mutations in QRDR were found in our tested S. Pullorum isolates. Mutations in QRDR were only present in the three strains of ST-2151, suggesting a potential correlation between microevolution and a resistant mutation. However, the strains with mutations in QRDR were also susceptible to ciprofloxacin and ofloxacin, which suggested that mutations in QRDR do not completely determine the susceptibility of S. Pullorum to fluoroquinolones. A number of isolates without mutations in QRDR were also resistance to (fluoro)quinolones, which suggested that more mechanisms were involved in (fluoro)quinolones resistance, such as efflux activity . Compared with most other serovars of Salmonella, more than 50% of isolates from chickens resistant to fluoroquinolones [35, 36], resistance rates to fluoroquinolones were low in our tested S. Pullorum isolates. As previously reported, biofilm-forming abilities are positively correlated with antibiotic resistance . However, a correlation between biofilm-forming ability and quinolones susceptibility in our tested isolates was not found. It might be due to the fact that the biofilm-forming abilities were extremely weak in our tested S. Pullorum isolates, and additionally, weak biofilm-forming abilities might also be an important reason of low resistance rates of S. Pullorum isolates. Formation of biofilms can protect bacteria against antibiotics by limiting penetration or forming specialized persistent cells. In our study, 14 isolates were non-biofilm producers, while the remaining 16 isolates could only form very weak biofilm (OD630 ranging from 0.217–0.259). In Salmonella, flagella are cell surface appendages involved in a number of bacterial behaviors, such as motility, adhesion, and biofilm formation . However, S. Pullorum does not express the flagellum proteins . Absence of flagella reduces the adhesive capacity of S. Pullorum and can lead to weak biofilm-forming abilities. In this study, a high resistance rate to the first generation of quinolines, nalidixic acid, but low resistance rates to fluoroquinolones agents were found in S. Pullorum isolates. In addition, weak biofilm-forming abilities were detected, which might explain the low fluoroquinolones resistance rates of S. Pullorum isolates. We found that ST-92 was the dominating genotype, and identified the new sequence type ST-2151, which showed potential correlation with Asp87Gly substitution in the QRDR of GyrA. We believe that the characterization of these S. Pullorum isolates will be helpful to develop prevention and control strategies. Xiaodong Guo and Honglin Wang contributed equally to this work. Analysis and interpretation of data, and writing were supported by National Key Research and Development Plan of China (2016YFD0500505), the design of the study and samples collection were supported by China Agriculture Research System (CARS-41-G13) and Technical innovation project of Hubei province (2018ABA108). XG, HW, GWen, and TZ participated in the conception and design of the study. XG, HW, YC, WZ, and QL performed the farm and laboratory work. XG, HS, and TZ analyzed the data and wrote the manuscript. GWang and HS contributed to the analysis and helped in the manuscript discussion. All authors read and approved the final manuscript. All animal studies were conducted in strict accordance with the guidelines of animal welfare of World Organization for Animal Health. The experiments were approved by the Ethics Committee of Hubei Academy of Agricultural Sciences according to Hubei Province Laboratory Animal Management Regulations – 2005. The ethics approval from the Ethics Committee of Hubei Academy of Agricultural Sciences was recognized as valid for research in all the five provinces involved in sampling in this study. The animals used in this study were derived from commercial sources, and the owner consent was not required.